More transitional fashion! I know we all have our love affair with skinny jeans, but sometimes it's nice to wear something less...constricting. 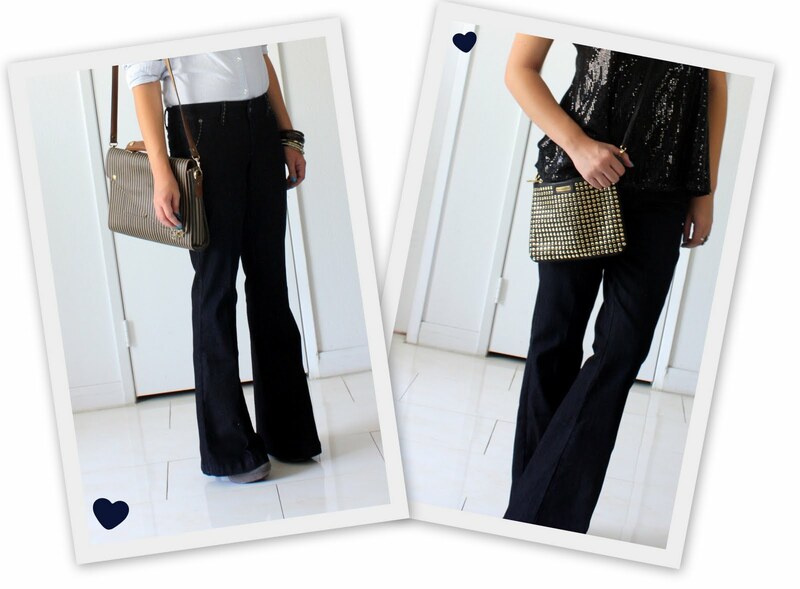 The wide leg trend is back, and the good thing is it can be dressed up and dressed down! Fitted slightly throughout the hip and thighs, these jeans are flattering, extremely comfortable (but the 33" inseam is a little long for my 5'4" height. I need to hem them) and a little dressy. For this post, I'll show you how trouser jeans can be worn during the day, as well as night. Just the right amount of casual--the dark indigo of the wash and trouser fit makes these jeans appropriate for everyday, or even Casual Friday. I paired mine with an Oxford button down (tucked in) and really high heels (which are hard to see, because I'm too short for the jeans). I added a strand of chunky faux pearls to feminize the outfit a little bit, and a vintage portfolio that my mom gave me. I chose neutral colors for my night outfit, but dressed it up with some sparkle. I'm kind of obsessed with sequin tops (but only the neutral colored ones, like gray and black) right now. I added a small crossbody bag (by Rebecca Minkoff; one of my favorites!) and high-heeled booties (again, they're invisible with the long inseam). And don't worry: the jeans are comfy enough to dance in. How would you wear trouser jeans?